I am very pleased with how this pastel turned out. It was initially called A Tree in the Sunset. I struggled with the clouds. It was unbelievable. I just couldn’t get them right. I redid them and redid them. The advantage of digital art is my two favorites, undo and erase. 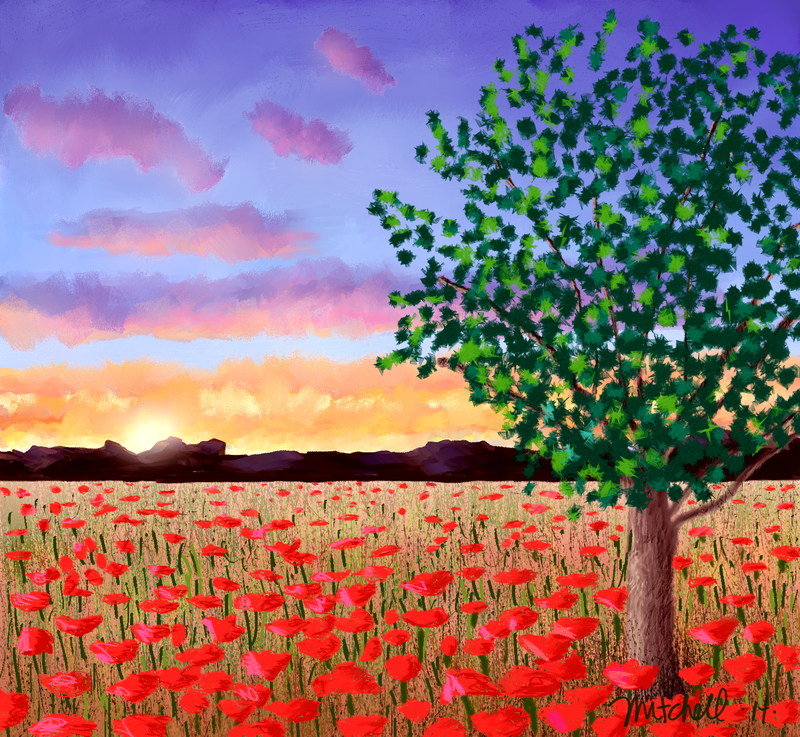 I was still not liking this piece, when I ran across a picture of a field of poppies. Red is my favorite color. Anytime I get an opportunity to add it to my art, I grab it. I still struggled with this piece further, but finally it is done. I belong to several private art groups on Facebook. They are a great place to hang my art. They are all very supportive. Everyone always just loves your art. Of course, if there were some helpful suggestions, we could all grow as artists. But sometimes, artists just need to know their art is liked and loved. Artists mostly work alone, and can get isolated. This is especially true in my case because I am limited because of the FM. I found a new FB page recently. It is called Magically Mixed Art Community. It is filled with fabulous art. It has over 15,000 members. It was started by Tracy Verdugo, a very talented artist and writer. You can check out her blog here. You can check out the Facebook group here. I posted this pastel there and got an overwhelming response to it. I was blown away. It feels so good to have so many talented artist like my work. It has been a long time since that has happened. Like 20 years. I hope you all enjoy the poppies. I send lots of love to all of you who are reading my blog today. This is a piece I did for Valentine’s day. 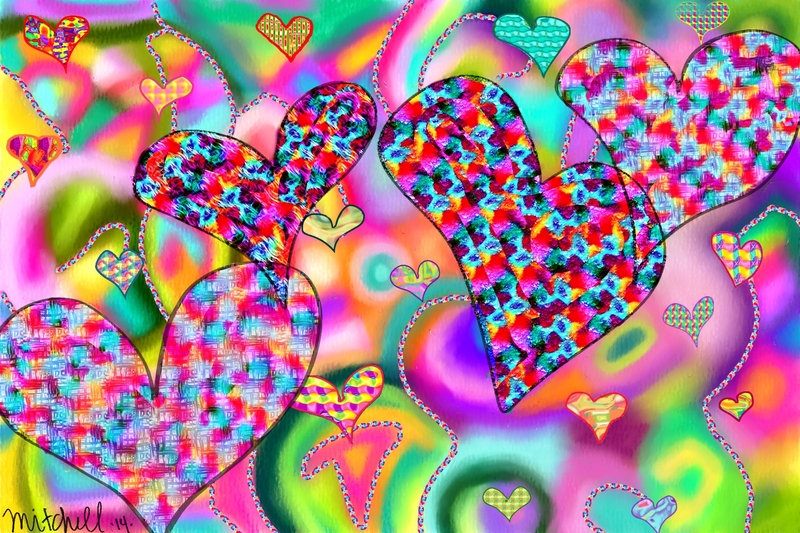 For those of you familiar with Painter, the app I use, I painted with pattern pens to make the hearts. Then I used overlays to get the texture that shows. I outlined with pattern pens. In the smaller hearts, I used surface effects on patterns. The background is made from pastels. I haven’t yet seen a subject in the Daily Prompt that inspired me. But today’s did. A quick aside, I’m not in pain today, Yeah! When I was about 16, an incident occurred where I could have been murdered. What was I doing at that age in such circumstances? My friend, Jill, and I had gone out for our usual Friday or Saturday night fun, which, for us, always involved drinking. Somehow we had connected with an older woman. She had been having us to her apartment for drinks, and we were more than happy to visit her. This particular night, her boyfriend came by. At first, I didn’t pay him much attention. It turns out he was drunk, and an extremely unreasonable person. He became jealous of my friend and I being at this woman’s house. Initially, I just thought, what an idiot. Then he got out his gun. OMG. He held it to my head and threatened to kill me. I don’t quite recall his reasoning for this, but he was determined. All I can recall is the woman begging and pleading with him to not shoot me. Obviously, he changed his mind. But what I really recall, is that it took a really long time to change his mind. What blows my mind about this incident is that it didn’t really affect either me or my friend. I don’t recall either of us talking about what had happened. Why we weren’t scared to death is beyond me now. In fact, it was not until I was in my late 20’s that I even thought about this incident again. This scares me a lot. When I was younger, I thought I was so cool and together. I had such intolerance for just about everybody and everything unless it fit into my box of coolness. Just exactly how cool is a person who gets into a situation where a loaded gun is pointed at her head by a drunk, crazy man? I continued down this particular road of beliefs into my 30’s. Then I got hit by a bolt of lightning and woke up. I came to understand how much broader life could be, and know that there was a God. There had to be. Who had looked out for me all those years while I ran around like a crazy person? I’m so grateful that I was able to realize who I am and that love is what is important in life, not who or what a person is. I find that putting love first, will always lead me in the right direction. Of course, this is not easy, and I often back step. But I believe my path of life, and it looks like many other experience this, is two steps backwards for every three steps forward. Writing about this makes me really grateful to be alive. So, Love to all of you this holiday season.